A beloved statue of Vladimir Lenin has found a new home in the East Village. Since 1989, an 18-foot statue of Lenin had presided over the rooftop of an East Village building known as Red Square. It was an anachronistic, cheeky tribute to the youthful, socially progressive neighborhood – made even funnier with the knowledge that Red Square is actually a market-rate rental building. But last fall, the statue was quietly removed after the building was sold to developer Dermot Company for $100 million. Many thought that was the end for Lenin, with rumors that developer Michael Rosen — the former owner of Red Square — moved it to his private residence. That rumor now seems to have been half true. 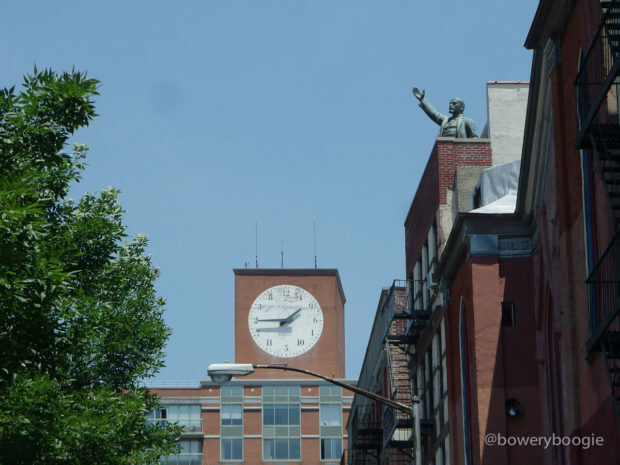 The Soviet statue reappeared this week at 178 Norfolk Street, a building owned by Rosen, according to Bowery Boogie.